The Serbian Grand Zhupan (Patriarchal leader) Stephen Nemanja had two sons, Stephen and Vukan; yet, he and his wife Anna desired, if it be God's will, to have another child. Their pious prayers ascended before God, Who heard their petition and blessed them with their last child, a son who was born in the year of our Lord 1175. At baptism the child was given the name Rastko, a name derived from the Old Slavonic verb "rasti" which means "to grow." And grow divinely he did. There were many special things about Rastko: he was a lovely child, with pronounced features and smooth skin, and possessed, already in his childhood, an unusually alert and pious demeanor. 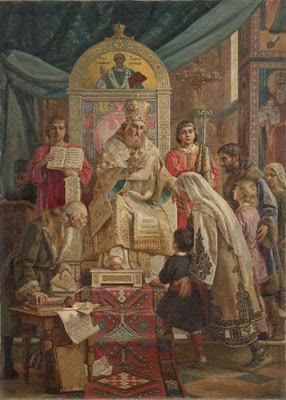 Little did Rastko's parents and all those of the Royal Court (and even the entire Serb nation) realize that his birth and baptism into Orthodoxy would providentially set in motion their own historical and spiritual journey, which would result in the blossoming of their Christian faith, nation hood and total Christian cultural orientation. This young child, Rastko, whose monastic name later was Sava, became and still remains the most beloved of all Serbian Orthodox saints, considered by all Serbs everywhere and at all times as the ultimate expression and example of what it means to be fully human, that is, what it means to be a devout and committed follower of Jesus Christ. Rastko, marriage and all worldly knowledge, authority or possessions could not compare to what he had experienced while in conversation with this unknown and simple monk from the Holy Mountain. "But how can I face my parents?" thought Rastko to himself. "How will I ever make such a journey to the Holy Mountain?" Pondering this dilemma, Rastko, by the grace of the Holy Spirit, came up with a solution. He organized a hunting trip and at an opportune time fled his homeland with the monk to make the long journey to the Holy Mountain. 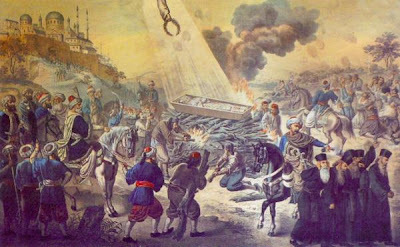 Discovering his flight, Rastko's father, Zhupan Stephen Nemanja, quickly assembled his best soldiers of the Royal Court and ordered them to the seaport city of Thessalonica, where he hoped they would catch up with Rastko. Stephen also sent a letter with his troops which they presented to the military governor of the city; in it the Grand Zhupan threatened violence to the city if his son was not safely returned. However, these efforts were unfruitful, as Rastko traveled quickly through Thessalonica and arrived by boat at the Russian Monastery of St. Panteleimon on the Holy Mountain. When the soldiers arrived at the monastery, the all-night vigil had just begun. The soldiers, not wishing to disturb the Divine Service, entered the Catholikon (main church) and sat in the stalls along the inner walls of the church. Spotting Rastko, they decided to wait patiently until the end of the vigil service and then order Rastko back to his father. However, the soldiers never expected the all-night vigil to last over six hours! As time passed, due to their being physically and mentally exhausted from the grueling journey from Serbia to the Holy Mountain, each of the soldiers fell fast asleep in his stall. Taking advantage of the situation, Rastko and an elder hieromonk (priest monk) quickly left the church and climbed to the top of the bell tower in the monastery courtyard. During the rest of the night and early morning, the blessed elder instructed Rastko concerning the monastic life and, just prior to the completion of Divine Liturgy (as Divine Liturgy follows every vigil service) the elder received Rastko into monasticism, tonsuring him and giving him the name of Sava, after the great ascetic and holy man of Jerusalem, St. Sava the Sanctified (Dec. 5th). When the soldiers awoke from their sleep in the morning, they quickly went to search for Sava. High up in the air from the window of the bell tower, Sava revealed himself, and then went on to explain to them that his monastic tonsure was completed and that they should not harm any of the monks. Then he threw down his shorn hair and civilian clothes; saying, "Please take this to my parents as a remembrance of my youth." This took place in 1193, when Sava was just 18 years old. Sava was not the first Serb to become a monk on the Holy Mountain, as there were Serbs there prior to his arrival. However, there was no Serbian monastery. Serbian monks found shelter and lived in the existing Greek, Russian, Bulgarian or Georgian monasteries, or eventually lived in caves, leading the life of a solitary or hermit. Only a few months after his tonsure, Sava was invited to the Greek Monastery Vatopedi for the celebration of its patronal feast, the Annunciation of the Theotokos (March 25th). It was here that Sava first began his true entrance into the profound spiritual life of monasticism. In leaving the Panteleimon Monastery, Prince Rastko was no more; now only Sava the monk was alive in Christ by the power of the Holy Spirit. Sava quickly proved to be a relentless warrior and ascetic for Christ. He kept constant vigil over his body, thoughts and passions—his total person. At times, the abbot of Vatopedi had to restrain Sava from excessive ascetic practices, for fear that he might harm his health. Also, as time passed, Sava's parents and brothers began to accept his new life and provided him with abundant financial support, which he unselfishly distributed to the various monasteries on the Holy Mountain. He had especial love for Vatopedi, providing it with assistance for both a new roof for the main Church of the Annunciation and for, the building of three small chapels. Vatopedi at this time was a kind of Byzantine university, as the monastery was lavishly supported by the Byzantine emperors as well. It possessed a large libraty full of all the ancient writings of the Fathers of the Church on the various theological topics of Christian life: Scripture, liturgy, asceticism, doctrine, sacraments, Lives of Saints, icons and architecture, and canon law. At Vatopedi Sava learned the ancient Greek language perfectly. (He had previously learned the contemporary Greek language from his mother Anna— named Anatasia as a monastic later in her life [see June 21st]—for she was Greek by birth, the daughter of the Greek Byzantine Emperor Romanos IV Diogenes [1068-1081].) Studying the writings of the Fathers of the Church, along with practicing the strict ascetic life and participating fully in the communal liturgical/sacramental life of the monastery, the image of God in Sava began to slowly shine forth, transforming him into a spiritual man of God, whose sole longing was to be with the Lord Jesus Christ in the bosom of God the Father, enlivened by the Holy and Gracious and Life-creating Spirit. In 1196, when Sava was 21 years of age, he received the greatest gift of his life: his father, Stephen Nemanja, decided to abdicate the throne of the Kingdom of Serbia and become a monk in Studenitsa Monastery on Mt. Radochelo in Rashka He took the name Simeon. To replace him on the Royal Throne, the Grand Zhupan appointed his second oldest son, Stephen, as the heir. This news thrilled Sava, as it was for him a spiritual blessing for his many prayers, ascetic efforts and even letters he had sent to his father urging him towards monastic life. Along with his father, Sava's mother Anna, on the same day—the Feast of the Annunciation, March 25, 1196—also received the monastic tonsure and was given the name Anastasia, retiring to the Monastery of the Holy Virgin in Kurshumlija near Toplica. At his son's request, the monk Simeon-Stephen Nemanja, only a few months after his monastic tonsure, left Serbia and traveled to Vatopedi Monastery. There for the first time in three years he met his favorite child, Sava, who by this time was an experienced and well-respected monk. The reunion was incredible. The biographer Theodosius writes: "They were both speechless; and, had not someone supported his father, he would have fallen. After he regained his composure, he poured many tears over the much longed-for and saintly head of his beloved son, embracing and kissing it and pressing it to his chest." Thus Sava's dream was coming true. Simeon's "conversion" and total acceptance of the monastic life marked a beginning once again, not only for the two saints, but perhaps more importantly, for the entire Serbian race. By this act, Simeon, the most powerful and influential man of the Serbian kingdom, was solidifying Serbia's ties with the treasury of spirituality of the Holy Mountain, as well as paving the way for all future royalty—rulers of the Kingdom of Serbia—to accept and acknowledge Orthodoxy as the way and ultimate criterion for the total christianization of the Serbian people. Simeon was like the Holy Byzantine Emperor of old, Constantine the Great (+337), paving the way for Orthodoxy to be the foundation and basis for all Serbian culture, history and civilization. The most wonderful element in the legacy of the monks Sava and Simeon —son and father— was their joint effort to bring to the Serbian nation a spiritual center in which prayer and committed Christian life would be the eternal flame and vigil lamp guiding the Serbian people to the Kingdom of God. This eternal torch and divine light was Hilandar Monastery. Hilandar Monastery was once a small monastic settlement which had fallen into ruin for many years. The property was owned by Vatopedi Monastery. Due to Sava's virtuous life and his representation of the Vatopedi brotherhood at the Imperial Court in Constantinople, and also because of Simeon's generous material support of the Monastery, the ruins of Hilandar, by Imperial decree, were given to the Serbs as an independent and self-governing property to be used as a monastery. This was made official by two foundational charters: the chrysobull of Byzantine Emperor Alexis III Angelos of Constantinople in June 1198, and the charter of Hilandar Monastery's co-founder, Zhupan Stephen Nemanja—monk Simeon—in late 1198. Hence, the idea of a Serbian monastery on the Holy Mountain became a reality when father became obedient to son, when both of these spiritual pillars of the Serbian people became totally dedicated to our Lord and Savior Jesus Christ and Holy Orthodoxy. In May 1199, the main church, dedicated to the Feast of the Presentation of the Theotokos in the Temple (November 21st), along with several other buildings necessary for the Monastery to function properly, were completed and consecrated. The Typikon of Hilandar (rules and regulations governing the communal prayer life of the monastery) was based upon the Greek Typikon of the Monastery of the Theotokos the Grace-giver in Constantinople, St. Sava's favorite Imperial monastery. St. Sava himself translated the Greek text of this typikon into Old Slavonic for use at Hilandar. When monastic life at Hilandar began, there were only fifteen monks, but within a short period of time the number grew to ninety. There was no doubt that the Hilandar community would be successful as long as the great Sava and Simeon were leading the way: that is, by being totally dedicated to Jesus Christ they were able to attract many candidates to the radically devoted monastic life Christ led by the Holy Spirit. Hence, Sava saw another blessing and miracle develop before his very own eyes: the arrival of many young Serbian ascetics desirous, as he was in his youth, of the totally committed life in Christ. To any normal Christian ascetic, these accomplishments would have been enough to perfect his own life or even make one consider himself great in God's eyes; but Sava never considered himself complete or perfect. He always sought "to get away from it all," to serve the Lord in the solitude of his heart, in order to be perfectas [his] Father in Heaven is perfect (Matt. 5:48). Therefore, to fulfill this desire placed within his soul by the creative and energetic grace of God, Sava traveled to the capital of the peninsula of the Holy Mountain, Karyes, in order to seek a piece of property there for the purpose of building a monastic cell for the solitary life in the Lord. From September to December 1199, Sava, only 24 years old (but with the wisdom of Solomon), built in Karyes, the capital of the Holy Mountain, a monastic cell and small chapel dedicated to his namesake, St. Sava the Sanctified of Jerusalem. To provide a liturgical rule of prayer for himself and for those who would live in the cell after him, Sava wrote his famous Karejski Typikon (Typicarnica). The Karejski Typikon is one of the most important documents in the history of Serbian spiritual literature. In 115 lines Sava detailed the rules for prayer, fasting and liturgical worship to be carried out by the kelliote (monk who lives in a cell) residing in Karyes. The Karejski Typikon was patterned after the ancient rules of prayer of the early ascetics who strived in the Lord in the deserts of Egypt, Sinai, Palestine and Syria. The Karejski Typikon expressed a most fundamental understanding and belief concerning human beings held to this day by all pious Orthodox Christians: the truth that all human beings are originally made and therefore destined to know and be friends with their Creator—God the Holy Trinity—and to be personally and intimately known by Him, which is a flowing and most powerful relationship of love, peace and joy. And this is totally possible for those who are seriously committed to "the Way, the Truth, and the Life," our Lord Jesus Christ who rests in the bosom of God the Father, and for those who are animated by the Holy Spirit. And if there is one clear message revealed in the life of St. Sava, it is precisely this: that the Christian life consists primarily in seeking and finding God, in searching and discovering His will, and in hungering and thirsting for His righteousness—Seek ye first the Kingdom of God, and His righteousness, and all these things shall be added unto you (Matt. 6:33). Sava's sojourn in his cell in Karyes built him into a pillar of Orthodoxy, as it was here that he prayed without ceasing (I Thess. 5: 17) and also wrote many hymns, treatises and prayers to the glory of God the Holy Trinity. Only a few months after the completion of his cell, Sava's father, monk Simeon, became grievously ill. On February 13, 1200, Blessed Simeon fell asleep in the Lord. He was 86 years old. (And only four months later, on June 21, 1200, Princess Anna-St. Anastasia, Sava's mother, fell asleep in the Lord at age 75 in the Monastery of the Holy Virgin in Kurshumlja near Toplica.) In Sava's biography of his father which he wrote in his cell in Karyes, he described the tremendous sorrow he experienced over the loss of his father, as well as the holy and divine way in which Blessed Simeon died. After Simeon's death, Sava asked the Lord God to reveal to him concerning the judgment of his father. One night, in a dream, Simeon appeared to Sava with a luminous countenance, and delivered a most powerful message to him. Simeon told Sava that Serbia needed him, that there was much work to be done there. Although Sava did not desire, after entering monastic life on the Holy Mountain, ever to return to Serbia, this message of Simeon made him realize that it was now time for the son to be obedient to the father. The state of affairs in Serbia had been quite poor ever since Simeon's departure in 1196: there was little religious leadership, and the brothers Stephen and Vukan were locked in a terrible fratricidal struggle for political rule of the kingdom. In response to the supplication of Simeon—whose appearance to Sava also demonstrated Simeon's own saintliness—and to the numerous pleadings for Sava to return on the part of his younger brother, the newly coronated King Stephen (11961228), Sava decided to travel back to his birthplace in the cause of peace, and in order to comfort and guide his Serbian people. Thus, in 1204, at age 29, after eleven years of monastic life on the Holy Mountain, Sava began his journey homeward. His departure was mourned by the monks, but they knew Sava's departing was the will of the Lord. Sava did not leave without honor bestowed upon him, as he was elevated to the rank of Archimandrite in Thessalonica by four bishops of the nearby dioceses. When Sava entered his native land in 1204, he unfortunately found the country just as Simeon had informed him in his dream—in total disarray. The Serbian state was split in two. By secret negotiations with Hungary and Pope Innocent III, Vukan, the eldest of the three brothers, who was bitter over the appointment of his younger brother Stephen as heir to the throne, was able to amass troops and capture Zeta; he then was set to launch a campaign against Rashka, King Stephen's portion of the divided kingdom. This civil war was only a microcosm of a larger conflict instigated by the West—that is, the hostilities initiated by the Great Crusades of the Latin church. In 1204, the soldiers of the Fourth Crusade captured Constantinople and much of the territory of Byzantium, including the Holy Mountain. In 1205, the Holy Mountain was officially placed under the authority and jurisdiction of a Roman Catholic bishop. It is believed that this occurrence was the most influential factor in Sava's decision to return to Serbia. Hence, the Saint returned home with his work cut out for him. When he returned, Sava brought with him the medicine to heal the entire situation: the relics of his father, the Grand Zhupan and saint, Stephen Nemanja-Simeon the Myrrh-bearer and co-founder of Hilandar. Upon entering Studenitsa Monastery, St. Simeon's foundational monastery, Sava invited his two brothers to a proper and rightful Memorial Service for their father. As the casket was opened, before their eyes the body of their father was found to be sweet-smelling, exuding a fragrant oil and myrrh, warm and aglow, looking very much alive, as if he were only restfully sleeping. This act of veneration of their father was the first step in healing the fraternal schism between Vukan and King Stephen. Shortly thereafter, the civil war was halted and a peace agreement was drawn up, once again restoring the kingdom of Serbia as it was under the reign of the great King Stephen Nemanja-St. Simeon the Myrrh-bearer. In discussions with his reunited brothers, Sava also designed plans for an immediate, systematic and far-reaching missionary program to save the Orthodox soul of the Serbian people. Studenitsa Monastery, with St. Simeon's relics making it a national shrine, was chosen as the outreach station for all activities. St. Sava wrote the Monastery's Typikon, which strengthened Studenitsa's monastic life. As newly elected abbot of Studenitsa, Archimandrite Sava personally went on several missions throughout the territories, preaching and teaching the Word of God in the churches as well as renewing and creating monasteries, building many churches, opening iconography schools, and in general establishing and confirming the populace in the Orthodox faith. Sava was concerned not only with the spiritual welfare of the kingdom, but also with the material condition of the people, as he constantly advised his two older brothers, especially King Stephen, on how to better feed, clothe and administer the people. It is believed that through the monasteries in Serbia at this time, Sava was able to put the kingdom's economy in order by raising to the highest level the production of food, wine, honey, fish, vegetables and livestock, not only sustaining the monastics but also benefiting thousands of Serbs: pilgrims, visitors, and especially the sick and aged. Truly St. Sava carried out and actualized the great commandment of Christ: Thou shalt love the Lord thy God with all thy heart, and with all thy soul, and with all thy strength, and with all thy mind; and thy neighbor as thyself. These missionary efforts were for Sava, as always, ascetic exercises allowing him to be more fully immersed in the eternal grace, love and beauty of the Holy Spirit of God. These acts demonstrated his tremendous love for his people. Sava was fast becoming a great Serbian ecclesiastical leader; and in the ensuing years his continual wise leadership would enable him to become a well-respected international ecclesiastical figure as well. The international situation, as mentioned, was also in disarray. The increasing papal power in the East could no longer be ignored. Byzantium was fighting a losing battle. The Byzantine Empire, like Serbia, was divided in two, with one political center at Constantinople and the other at Thessalonica; with the two rival factions, the Niceans and the Epirotes, fighting for political control over the Empire. The Patriarchate of Constantinople, the ultimate ecclesiastical administrative overseer of Serbia, was split in three, with centers at Nicea, Trebizond and Ochrid. As a result of this confusion and turmoil, King Stephen, at the advice of his wife, Queen Anna, decided to ally Serbia with the Pope of Rome in order to stem the tide against the attacks of the Hungarian King Andreas III and those of the Latinophiles in Constantinople. This decision on the part of Stephen angered his brother Sava, who, due to his loyalty to Orthodoxy and the Byzantine State, decided to return to the Holy Mountain. Hence, in 1217, at age 42, after thirteen years of missionary activity in his homeland, Sava traveled once again to his true spiritual home, Hilandar Monastery on the Holy Mountain, in order to be alone with his Lord and Savior Jesus Christ. And, like his Savior so often did, Sava too "departed from his flock for a little while" in order to rest in the bosom of the Father, and to retreat from the world and its passing struggles and desires. Yet this was only for a short while, for the Lord had many tasks still ahead for Blessed Sava to fulfill. Sava spent a little less than two years at Hilandar after his departure from Serbia (1217-1219). The moment he left, Serbia's situation worsened both domestically and internationally. The miracle-working oil exuding from the holy relics of his father Simeon stopped flowing. The people were outraged at King Stephen for driving Sava away. Under no terms would they accept the Pope's support and disavow Orthodoxy. As a result, Stephen wrote to Sava imploring him to return. Stephen also renounced his western ties and attempted to reconcile with the Byzantine emperor in Nicea, Theodore Laskaris (1204-1222). Spending his days and nights in prayer and vigil, guarding his soul from all passions, and incessantly petitioning the Lord in behalf of his Serbian people, Sava was elated to receive his brother Stephen's repentant letter. When he heard from Stephen, Sava immediately went to his cell and prayed tearfully to his father Simeon: "O Saint, having been commanded by God and implored by us, please disregard our transgressions. For whatever we are, we are still your children. Allow, therefore, the myrrh to flow again from your body in the tomb as before, to bring joy and relief to your people now in mourning." This prayer, which Sava sent to King Stephen in a letter, was read aloud before the tomb of Simeon in Studenitsa Monastery and was then published throughout the land. The letter also disclosed plans Sava had received in a dream from Almighty God: to obtain from Nicea the independence of the Serbian Orthodox Church. When the letter was read aloud in Studenitsa, immediately the miraculous myrrh from the relics of the holy patriarchal leader Simeon began to flow once again. Thus, by the will of the Lord, Sava set out to journey homeward for a second time from Hilandar in order to heal his people and to bring them glad tidings of salvation, faith and unity. I, Manuel, the Ecumenical Patriarch and the Archbishop of the City of Consrantinople, New Rome, in the name of our Lord Jesus Christ, have consecrated Sava, Archbishop of all the Serbian lands, and have given him in God's name the authority to consecrate bishops, priests, and deacons within his country; to bind and loose sins of men, and to teach all and to baptize in the name of the Father, and the Son, and the Holy Spirit. Therefore, all you Orthodox Christians, obey him as you have obeyed me. After his consecration, Sava returned to the Holy Mountain in order to say farewell to Hilandar and to receive the blessing and prayers of the entire monastic community of the Holy Mountain. This was the most emotional moment in Sava's life. To the Holy Mountain (and Hilandar in particular), his true spiritual home, the holy place where he had spent over twenty-five years of his life and which he thought he would never leave, Sava now had to bid farewell. Although the monks welcomed him and treated him with the highest dignity and respect accorded his ecclesiastical position, they all nevertheless were saddened by the loss of their beloved brother and friend, the simple monk Sava. And if there is anything that shines forth and is easily ascertained from Sava's personality and character, it is precisely this: no matter what position or accolade or accomplishment Sava attained or achieved, he never forgot his spiritual core and roots, which were to love and live with Christ in simplicity, in common friendship and in humble love. When he arrived in Serbia, Sava, the first Archbishop of the Serbs, was greeted with open arms by his brother King Stephen and his nephews (Stephen's sons), Princes Radislav (1228-1233) and Vladislav (1233-1243). Sava went straightway to Studenitsa to venerate his father Simeon's myrrh-flowing relics. After a short stay there, he left in order to ascend his archiepiscopal throne in the newly consecrated Zhicha Monastery, the foundational monastery of King Stephen, located on the right bank of the Ibar river only five miles southwest of Kraljevo. The architectural style of Zhicha Monastery was of the school of Rashka or the Serbo-Byzantine style, characterized by the semi-circular apse at the eastern end of the main church, a separated narthex (entrance area or vestibule on the west end where in the monasteries the Divine Services of Compline, Midnight Office, Hours and the Litya on the eve of Great Feasts are said), along with a large dome joining the two ends to focus the worshippers to the center of the church. A unique feature of the main church of Christ the Savior in Zhicha was the brick and stone construction of the church which was plastered over and colored red, after the model of the Holy Mountain monasteries, symbolizing the blood which our Savior and His beloved followers, the holy Martyrs, shed "for the life of the world." As the spiritual center of Serbian Orthodoxy, Zhicha Monastery would once again lead the efforts toward the total enculturation of the Serbian people into the Orthodox vision and way of life. To establish Zhicha as the religious and political center of the kingdom of Serbia, Sava decided that on the first day of his archiepiscopacy in Zhicha, the Feast of the Ascension, 1220, he would, as the newly consecrated Archbishop of Serbia, coronate his brother Stephen as the first Serbian King. Even though Stephen had previously assumed the throne in 1 196 after his father Stephen Nemanja-St. Simeon had abdicated, nonetheless his coronation at this time officially proclaimed him, before all countries, as the rightful Orthodox King of Serbia. This coronation marked the end to any western ties by the Nemanja dynasty. Accordingly, Stephen received the title "Kralj Stephen Prvovenchani" (King Stephen the First-Crowned). King's death, his son Radislav came into power. Unfortunately for the Serbs, Radislav favored his Greek mother Eudokia's side. As a result, the newly coronated King Radislav, against the wishes of Sava, called for a return of the fledgling Serbian Church to the protectorate of the Greek Archbishop of Ochrid. This political maneuver was too much for Sava, and he once again had thoughts of fleeing his homeland. But where could he go? He was now their permanent Archbishop and could not possibly go back to Hilandar. After some deliberation, Venerable Sava decided to visit Jerusalem and the Holy Land. Thus, in 1229, after ten years of dedicated hard work and fruitful labor in the vineyard of the Lord in his homeland, Sava decided to renew his own spirit by pilgrimaging to the cradle of Christianity itself, Jerusalem, where the Lord first brought salvation to the world. In Jerusalem, Sava purchased the house in which, according to some records, Jesus Christ and His disciples celebrated the Passover in the year he was crucified. He bought it from a Muslim and returned it safely into the hands of the Orthodox Church in Jerusalem. Also, Sava made arrangements which facilitated visitations by Serbian pilgrims to the Holy Land. He paved the way for Serbian monastic colonies to settle and flourish in Palestine and the surrounding desert areas during the time of the Serbian Medieval State (early 13th to mid l5th centuries). Sava also built new churches, renewed existing ones, financed monasteries, and spent many hours in conversation with the great ascetics of the deserts of the Middle East, learning more of the art of prayer, fasting, and the taming of the passions of the flesh. In particular, Sava visited the monastery of his namesake, St. Sava the Sanctified of Jerusalem, where his episcopal ministry was confirmed by his fulfilling a seven hundred-year-old prophecy whereby he received two famous miraculous icons, the Miraculous Icon of the Theotokos "With Three Hands" (called "Troiruchica" in Slavonic; see July 12th) and the Miraculous Icon of the Theotokos "The Nursing Virgin" (see July 3rd), and brought it to Hilandar and placed it in his typicaria. When it was time for Sava to leave the Holy Land for Serbia, he decided to go by way of Nicea. He did this to further solidify the promise made by Patriarch Manuel in 1219 to keep the Serbian Church autonomous. There he met with John, the new Emperor of Byzantium (1222-1254) now residing in Nicea, who succeeded Theodore Laskaris. He also met Germanus, the new Patriarch who succeeded the late Patriarch Manuel. Irene, Emperor John's wife and the daughter of the deceased Theodore Laskar, is, was present at these meetings, and she recalled memories of Sava's first visit to Nicea. Sava at this time petitioned for autocephaly, i.e., the right of the Serbian bishops to select and consecrate their own Patriarch. This promise was made to Sava in 1219, and he was in Nicea to renew this pledge. Although this latter request was not granted, Sava nevertheless confirmed the independence of the Serbian Church from the Archbishop of Ochrid. Hence, the plans of the new King Radislav were thwarted. Also, unfortunately for Radislav, his military prowess waned as well, for in a fratricidal civil war against his younger brother Vladislav during the summer of 1233, he was defeated and exiled to Durazzo, Albania. Although Sava was unsuccessful in reconciling these brothers—who were both disloyal to their grandfather St. Simeon's call for unity—nevertheless he knew it was better for the country to be ruled by Vladislav. Several years later, as a result of his negotiations with King Vladislav, Sava was able to obtain safe conduct for Radislav, who was allowed to return to Serbia. Unfortunately again for Radislav, his wife had eloped with a French duke during his exile in Albania. Radislav then decided to become a monk, and Sava tonsured him, giving him the name John. In the spring of 1234, Archbishop Sava, age 59, only five years after his first trip to the Holy Land, decided to make a second pilgrimage to Jerusalem. This time he had particular goals in mind. 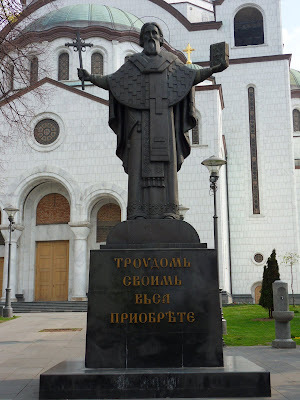 He wanted to garner support for the Bulgarians who were seeking the ecclesiastical status of autocephaly. Previously, the Imperial Patriarch residing in Nicea had recognized this new situation in Bulgaria, but the Patriarchs of Jerusalem, Alexandria and Antioch had not followed suit. Sava also hoped to seek this same type of support from these Patriarchs in behalf of his own autonomous Serbian Orthodox Church. His mission was to promote the federation of Orthodox sister churches with Jerusalem as the eternal mother Church. There is no doubt that these ecclesiastical missions demonstrated a far-reaching and even prophetic insight on the part of Sava. For the Serbs, he was setting in motion something which would come about only one hundred years later—the autocephaly of the Serbian Church. Sava was a man of his times with a clear vision of the future! Yet there was something even more special about Sava which was personally exhibited by him just prior to his second trip to the Middle East. For no apparent reason, Sava decided to abdicate his archiepiscopal throne. He appointed one of his younger disciples, Arsenius, to be the Archbishop of Serbia. In accordance with the canons of the Orthodox Church, Arsenius was then elevated by the assembly of bishops gathered at Zhicha. This was confirmed by the Imperial Patriarch in Nicea. Sava, like the saints of old, displayed prophetic insight far beyond human wisdom and reason, as no one at this time realized that when they escorted their beloved Saint to the Serbian kingdom's border so that he could begin his trek to Palestine, they would never again see him alive in this world. Sava knew the Lord would soon call him home to the Heavenly Mansions of the righteous, and thus, as a good archpastor, he lovingly prepared his spiritual children for their own future. Upon arrival in Jerusalem, Sava lodged at the St. George Monastery in Akre, a monastery he had purchased from the Latins during his first pilgrimage. Sava visited Patriarch Athanasius of Jerusalem and then went by boat to Alexandria, Egypt, to meet with Pope Nicholas, "Patriarch of Alexandria and all Africa." He then went to St. Catherine's Monastery on Mt. Sinai, where he spent Great Lent of 1234. This was a most blessed Paschal journey for Sava, for he climbed the heights where the great man of God, Moses the God-seer and Deliverer of his people, had spent many hours speaking to the Lord God face to face as a friend converses with a friend. Sava, too, had been a "Moses" to his people, pastoring, leading and organizing them into a community of God. After the Paschal celebration of 1234, Sava returned to Jerusalem and then traveled to Antioch. After visiting Constantinople, Sava intended to visit the Holy Mountain and Hilandar, but "it did not please the Holy Spirit." Instead, he left for Trnovo, Bulgaria, the capital of King Ivan Asen II's Bulgarian kingdom. Sava arrived in Trnovo on January 1, 1235. He was received with great honor and dignity, not only because of his efforts on behalf of the Bulgarian ecclesiastical authorities while in the Middle East, but more importantly because he was truly the most respected and venerated person of his era. At the request of King Ivan Asen II, Sava stayed at the Royal Palace in Trnovo. Many state dignitaries, monastics, clergy and pious faithful came to venerate this holy pastor and to receive his blessing. Sava officiated at the Divine Liturgy on Epiphany, January 6, 1235, in the Royal Cathedral of the Holy Forty Martyrs in Trnovo. As was the custom, he participated in the service of the Blessing of the Waters held outside the Cathedral, at the nearby Jantra River. After the Divine Service, the Saint caught a cold which developed into pneumonia, eventually causing his death during the night between Saturday and Sunday, January 14, 1235. He was 60 years of age. The news of St. Sava's death was a shock for both the Serbian and Bulgarian nations, as well as for the entire Byzantine commonwealth. The saint received a most honorable Christian burial and was laid to rest in the Cathedral of the Holy Forty Martyrs in Trnovo. He remained in Trnovo for over tWo years, until May 6, 1237 when, after the personal visit of the Serbian King Vladislav, a solemn procession from Trnovo to Mileshevo Monastery returned the Saint to his rightful homeland. Mileshevo Monastery, located only a few miles east of the Lim River near Prijepolje, was founded by King Vladislav (1234-1243). Although renowned for its beautiful icons and frescoes—the Angel at the Tomb of Christ for example—the Monastery could never have imagined the attention it would receive after the placing of the body of Sava in the main church. Upon opening the casket, Sava's body was found completely intact, fragrant, exuding myrrh, looking simply as if he was comfortably sleeping. Thousands of pilgrims—Serbs, Roman Catholics, and even Jews—came to venerate the divine Sava. To all, he was a source of unity, healing, wisdom, joy, and spiritual strength, uniting the various tribes of Serbs into a cohesive nation of Orthodox believers. As a result, only eighteen years later, in 1253, the Orthodox Church of Serbia officially canonized their beloved St. Sava (see April 27th and May 6th). As time passed, the tremendous legacy of holy leadership on the part of the great Sava kept the Serbian people united under one flag: the royal kingdom of Serbia which avowed Orthodoxy and the way of Christ. He was the sole person who was responsible for the transformation of the Serbian people into a people of God. And their allegiance to the way in which he lived was to the Serbs the only true model and expression of religious, political and cultural life. Hence, as in the case of every great human being who inspires generations after him to even greater heights of civilized life, so too was it with Sava, for his ideal motivated the people of Orthodox Serbia to become, in the thirteenth and fourteenth centuries, one of the most resplendent kingdoms the world has ever known. Religious life peaked as the monasteries in Serbia, the most beautiful being based upon the Byzantine style, were crowded with monastics who led an austere life, inspiring the Serbian people to greater heights of humility, while also leading them to exhibit the trait they were (and are to this day) most recognized for—hospitality. And, as mentioned, due to the astute ecclesiastical wisdom on the part of Sava in 1219 in Nicea, the Serbian Church was able, in 1346, to obtain her own autocephaly, i.e., her own Patriarch. Political and economic life also flourished, following the example of the Christ-like Sava, in the centuries following his repose in the Lord. A unity among the Serbs, based on their adherence to Orthodoxy and maintenance of the political ideals of their beloved St. Sava, allowed them to develop into a Balkan power to the point that in 1346 the Serbian King Dushan the Powerful was given the title of "Emperor of the Serbs, Greeks, Bulgars and Albanians." In sum, after his death St. Sava was to the Serbs a type of ideal and measuring rod of what it meant to be a true Serb, which is, to be fully committed to Jesus Christ and the way of Orthodoxy. 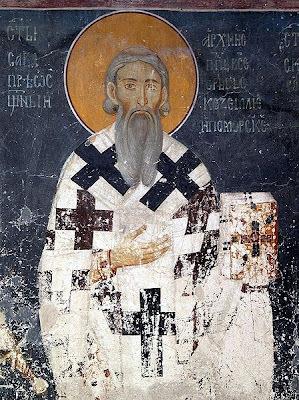 Religiously, Sava was thought of as an equal to St. Nicholas, the ideal and standard of bishops; as a humane politician, Sava was considered an equal to St. Constantine the Great, the founder of the Byzantine Empire; and, as a Great Martyr later in 1595, Sava was considered an equal to the humble St. Polycarp of Smyrna, the first Great Martyr to be burned to death (see April 27th, Burning of the Relics of St. Sava). Bless the Lord God! All these Christian traits and attainments manifested in one person! During the two centuries following his death, the person of St. Sava became the brightest star ever known to the Serbs, inspiring them to a way of life which succeeding generations have as yet been unable to recapture or match. This love for Sava continued unabated even during the time of the barbaric Turkish occupation of the Serbian lands, beginning with the Battle of Kosovo on June 15, 1389. On that day, the Serbs chose to remain faithful to Christ, Orthodoxy, and the embodiment of their faith, St. Sava. After receiving the Precious Body and Blood of our Lord and Savior Jesus Christ on the eve of the Battle on the Field of Blackbirds, the Serbian armies went on victoriously to their martyrdom and "crucifixion" at the hands of the ungodly Turks, proving to history (and of course to themselves) that it is better to die for Christ, the way and the truth and the life, than to live for any earthly cause or dominion. This martyrdom on Kosovo Polje, more than any other event in the history of the Serbian race, proved their allegiance to the way of life that St. Sava taught them, that is, living with Christ the Lord in His Heavenly Kingdom. It was this vision of life which sustained the Orthodox Serbs during the oppressive times to follow. It was this vision given to them by St. Sava which was their hope. Not a vanquished hope or a defeated one, but a hope that was alive, hallowing, sustaining, unifying, strengthening, abiding, and truly a hope worth living for, no matter what the costs. This vision was salvation to the Serb! No wonder the Turks, on Orthodox Holy Friday in 1595, could not withstand this unifying force, the force of committed life in Christ led by the example of St. Sava, for they once again "cracked" under this pressure and, to their eternal folly and damnation, incinerated the life-giving body and relics of St. Sava (see April 27th). They believed they could kill the spirit along with the body—something the unbelieving Jews thought they could also do with Jesus on Golgotha—on that glorious day on Savinac Hill in the district of Vrachar in Belgrade. However, to their dismay, the Serbian Orthodox spirit was only made stronger by this ungodly act, for all pious Serbs at that time and to this day believe in a Lord and Master, the Savior Christ, who was savagely and brutally crucified and martyred for the life of the world; and Who rose from the dead, trampling down death by death, Whose victory and Kingdom will have no end. This Great Martyrdom of St. Sava was not an end for the Saint, but a beginning, for along with the title of "Venerable Holy Father and First Archbishop and Eternal Enlightener to the Serbs," he was granted, by Divine Providence, the most wonderful title of "Great Martyr," thus fulfilling a legacy that certainly will last forever! And to his glory, on that very Savinac Hill in Vrachar, a glorious Cathedral is being erected to once and for all confirm his steadfast love and example of unity, strength and piety that every Orthodox Christian everywhere must follow in order to inherit eternal life! Source: From The Serbian Patericon by Fr. Daniel Rogich.